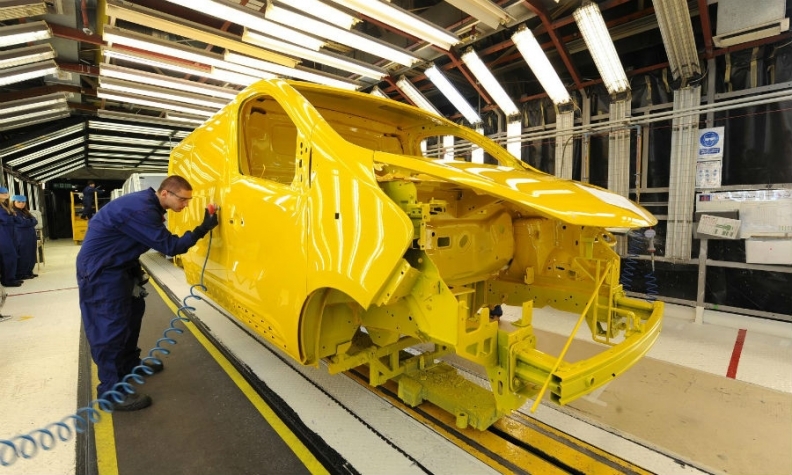 Vauxhall's Luton plant builds Vivaro vans. PARIS -- PSA Group plans to end a venture between its Vauxhall brand and rival Renault that makes vans at a plant near London and instead use the capacity for its own output, people familiar with the matter said. Ending the venture would allow PSA take full advantage of the plant in Luton, England, said the people, asking not to be identified because the decision hasn't been made public yet. The venture produces the Vauxhall/Opel Vivaro medium-sized vans, which share underpinnings with the Renault Trafic that has also been assembled at the Luton plant in the past. PSA could build its own vans for those brands at the plant, the people said. Right-hand-drive variants of the Peugeot Expert and Citroen Jumpy models will be built in Luton alongside future versions of the Vivaro, a company source told Reuters. PSA purchased the Opel and Vauxhall marques last year from General Motors for about 2.2 billion euros ($2.7 billion). Vauxhall mainly produces vans in Luton and also operates a factory in Ellesmere Port, England, that makes the Astra hatchback and station wagon. Tavares has pledged to turn around the operations of Vauxhall, which has been building largely identical cars to models designed by Germany-based Opel. The UK's planned exit from the European Union puts an increased focus on competitiveness at PSA's factories in the country, Tavares told Bloomberg last year. Increased production at Luton would be a boon for UK Prime Minister Theresa May amid concern that manufacturers may cut jobs and move production out of the country as it leaves the EU. Tariffs and other hurdles to trade after Brexit could crimp auto output since parts routinely move across borders several times during the manufacturing process. A PSA spokesman declined to comment, as did a Renault spokesman. PSA CEO Carlos Tavares plans to go to the factory for an announcement Wednesday, sources said.